During my 2015 journey to the north of European Russia, I had sketched out an idea for a very ambitious future trip, right across Russia from Magadan on the Pacific coast back to Europe in the depths of winter, satisfying a long-time desire to visit the world’s coldest inhabited areas and explore the Russian north on winter-only roads. Returning to my relatively new, settled life in July 2015 in a charmless corner of North-western Europe, I would find that what had once seemed like an exciting opportunity would pan out to be a disappointing career in an industry witnessing its largest crash in history. However, the extensive planning and preparation for this winter trip would give me something firm and positive to focus on, working towards an expedition which few had attempted. Preparations began in November 2015 with the purchase of a second vehicle, a Toyota Hilux Surf 4×4 with a petrol engine and manual transmission. The vehicle required such extensive mechanical repair and preparation that a proposed departure date of August 2016 had to be delayed by a year, as I spent weekends in the garage ensuring the vehicle would be mechanically fit for such a testing trip. In the early stages of planning I had dismissed the idea of shipping the vehicle straight to the start point of Magadan and so there would be an outward, eastward journey across Russia in 2017, finishing just before the winter set in. This transcontinental journey would be a fast-paced road-trip, crossing very nearly all of Russia; from its European west, across the Urals, the lowlands of West Siberia, the mountainous republics of southern Siberia, wild taiga of eastern Siberia, and on into the Russian Far East. At the Pacific coast I would turn around, heading north into the wilderness for the long journey to Magadan where the Hilux Surf would be put into storage in preparation for departure in January 2018. Finally setting off after work on the afternoon of the 11th August, I drove overnight to Gdansk in Poland where I met my friend Maciej who would accompany on the eastward trip. Together we would make a very memorable journey across the vast and subtly changing landscape of Russia, starting in the sweltering days of late summer and ending in the opening stages of a brutal winter. Nine weeks and more than 23,000 kilometres driving Trans-Eurasia. It’s the afternoon of the 13th August 2017, and Maciej and I enter Russia’s exclave Kaliningrad Region, taking our fist steps into Russia on the long road to Magadan. Leaving the border town of Mamonovo we make a side trip up to the ruined red-brick fortress of Balga, a medieval castle of the Teutonic Knights which has long been in ruin, though was heavily damaged in the Second World War when it was the site of one of the Red Army’s final battles with the Wehrmacht. Today the castle is a sad ruin in the midsts of being reclaimed by the forest, with clumps of its exploded masonry lying on the wild shore of the Vistula Lagoon. Returning to the main road just before sunset, we strike our first camp in a large fallow field surrounded by a tall, natural perimeter of trees. After years of preparation I’m thrilled to be on the road at last, enjoying life with thoughts of work well out of my mind, though this idyll is almost broken when my camping stove bursts into flame on first use. 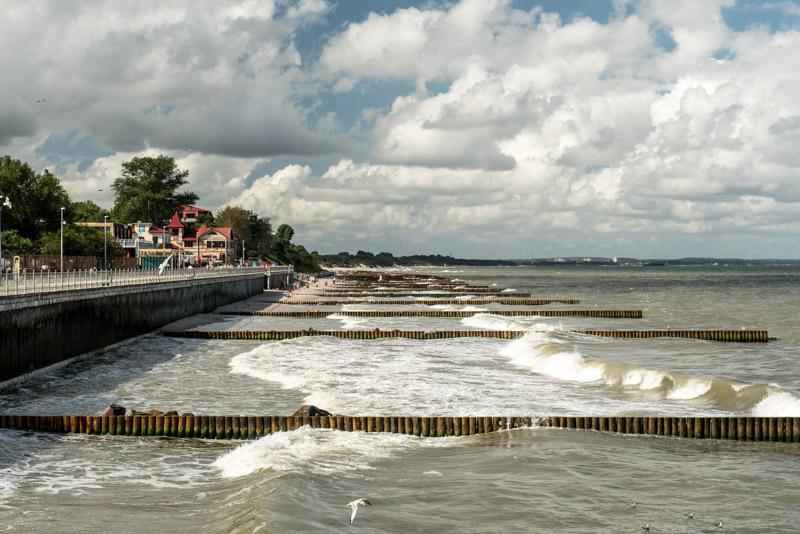 In the morning we pass straight through the city of Kaliningrad, stopping in Zelenogradsk on the wind-swept Baltic coast. Once known by its German name of Cranz, Zelenogradsk is a faded nineteenth century resort, an odd mix of Germany and Russia with an air of what I imagine might still be post-war dereliction and depopulation; the same impression that I had in 2010 on my previous visit to this intriguing spoil-of-war territory. We leave on a small road heading out onto the Curonian Spit; a long finger of land which stretches over into Lithuania. In contrast to the general scruffiness of the ‘mainland’, the spit is a beautiful stretch of wilderness, thickly forested with occasional bare slopes of sand dunes. 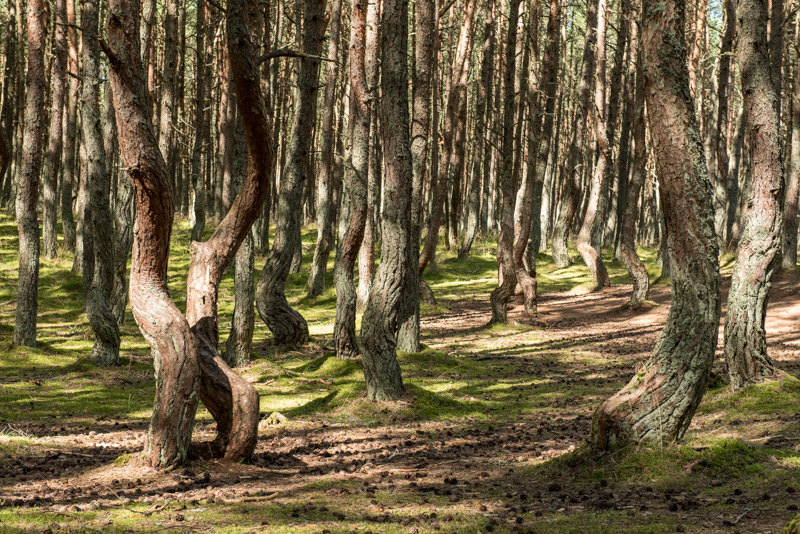 It’s popular with tourists from Russia and the Baltic States, but still a pleasant place to spend an afternoon, seeing the ‘Dancing Forest’, a patch of strangely twisted pine trees, walking through another stand of forest to the tranquil Curonian Lagoon, or watching the breakers wash onto fine, sandy Baltic beaches. Late in the afternoon we enter Lithuania through a quiet border crossing, driving north to catch a ferry back to Klaipėda on the mainland. We drive the next day through Lithuania into Latvia, passing through Riga then heading across the country, cutting through the very south-eastern corner of Estonia to cross into Russia at the border crossing of Shumilkino, where I had finished my 2015 trip. One of the immigration officers asks me my destination in Russia. ‘Magadan’ I tell him. He looks at me for a second, then warns me that Magadan is a Gulag. ‘All Russia is a Gulag’ adds a young colleague sardonically. Now in Russia proper, we truly set off on the road to Magadan. It’s a beautiful, warm summer evening and we soon stop in Izborsk to visit the town’s fourteenth century stone fortress, one of Russia’s oldest, which sits on grassy rise, beautifully illuminated by the soft evening light. Legend tells that in the ninth century Izborsk was the seat of Truvor, brother of Rurik, founder of the dynasty that would govern Russia until the seventeenth century and, as we listen to the gentle sounds of village life floating in the warm evening air, we tell ourselves that we are really in Russia. It’s after dark by the time we reach Pskov, a city I have twice passed through without stopping and am keen to properly visit. Pskov is one of Russia’s oldest cities, first being mentioned early in the tenth century and was initially part of the Novgorod Republic, then independent, before being incorporated into the Grand Duchy of Moscow. Traditionally a border city, Pskov grew rich on trade but its fortunes waned when Peter the Great pushed the border of Russia westward in the eighteenth century, roughly to its current location. Maciej and I are hosted by Vladimir and his wife Rita, who live in a Soviet apartment complex on Pskov’s main Rizhsky Prospekt (Riga Prospect) on the city’s western edge. A computer programmer, Vladimir also describes himself as a social activist and tells us that he was threatened with legal action from the authorities in his previous home in Moscow, for reasons he does not elaborate on, and now keeps a low profile in this relative backwater. As Maciej and I leave his apartment the next morning to spend the day in the city, Vladimir is out watering some saplings which he has recently planted outside his home, trying to take the edge off the brutal Soviet concrete gigantism. Pskov indeed comes across as a slightly down-at-heel place, the capital of one of Russia’s poorest regions. Happily, this seems to have largely spared it from the ugly rash of modern development, which together with the friendly nature of local people give it a pleasant, provincial air. 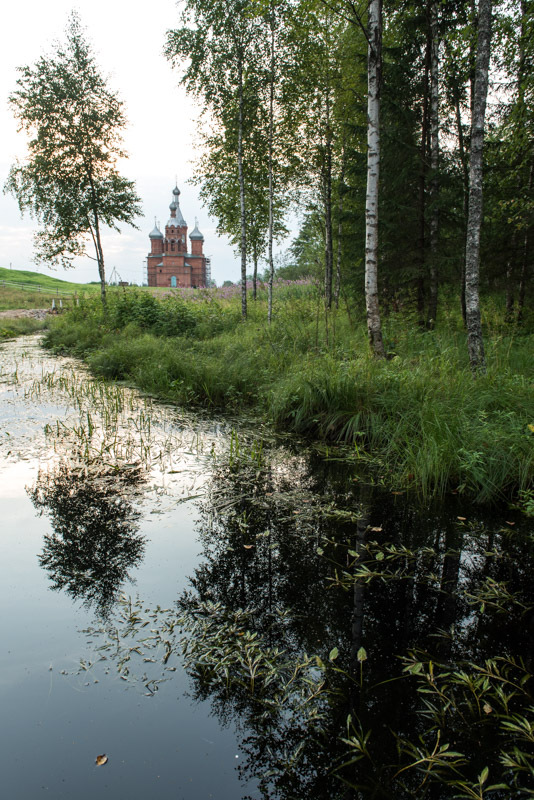 As we reach the banks of the Belaya River however, we see Pskov’s magnificent ancient centre, which spreads around the imposing fifteenth century Krom, or fortress. This beautiful landmark is one of the finest pieces of medieval Russian architecture I have seen, sitting above the calm river with large, red letters spelling out ‘Russia starts here’ on the bank. Crossing the river, we enter a centre of shady parks and countless small churches, albeit above the dust, noise and fumes of modern traffic. South of the centre is the serene Mirozhsky Monastery, whose twelfth century Transfiguration Cathedral is a rare pre-Mongol building and contains beautiful frescoes showing the life of Christ with clear Byzantine influences. We end our tour of the city drinking beers in the evening warmth on the riverbank overlooking the Krom, delighted at the prospect of a journey across the world’s largest country. We leave Pskov in the morning of a sultry, late-summer day and head north-eastwards on a pleasant country road, passing the coffee-brown waters of Lake Ilmen and the ancient town of Staraya Russa, once a summer home of Dostoyevsky but which today looks rather run-down and seedy. We turn south-eastwards onto unpaved roads, heading for the Valdai Hills, an upland of thick forest, swamps and lakes which form the highest point of the huge East European Plain. Out here the villages are isolated and rather idle; stopping in one we attract a group of friendly drunks who talk to us; one stumbling, punch-drunk man tells me he has a sister living in the UK, before asking for fifteen roubles to help him buy a bottle of port-wine. We cross into Tver Region in the evening and make camp in a small forest clearing next to a beautiful lilly-filled pond. As we sit inside the car drinking beer, taking refuge from the mosquitoes, we are jolted by a loud explosion. Far too powerful to be a gunshot, I guess it might be locals dynamite fishing in these remote backwoods. We leave at dawn the following morning and just after sunrise reach the tiny village of Volgoverkhovye. Here, in a small, tranquil bog on the edge of a stand of birch forest, alive with the sound of chirping frogs and buzzing insects, the Volga rises and begins its journey to the Caspian Sea. The bog drains through a stand of water hyacinths into a tiny stream and it is quite mind boggling to think that this is Europe’s longest river, in places so wide that one cannot see from one bank to the other; the backbone of European Russia, flowing south-eastwards almost to the borders of Asia. 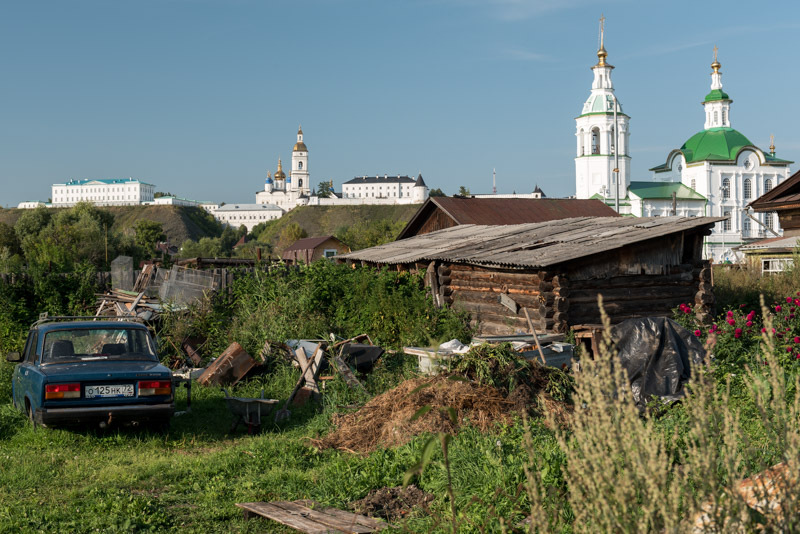 We spend the day driving east towards the capital, passing Ostashkov and Torzhok, then getting lost on small country roads which end in forlorn villages, eventually finding a route to the tiny village of Krasnoye. 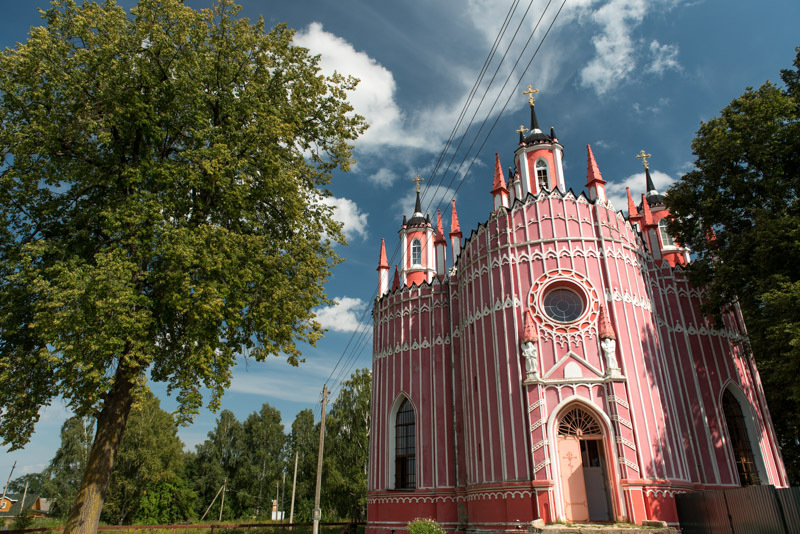 Here we find the astounding Transfiguration Church, a pink piece of Gothic Revival of very unusual proportions; a circular plan with four subsidiary circular apses, all covered in narrow, white vertical bands. The church is a copy of the Chesme Church in Saint Petersburg, commissioned by Catherine the Great to commemorate Russia’s victory over the Turks at the Battle of Chesme in 1770 and is utterly at odds with the simple village scenes which unfold around it. Approaching the church we are given a tour by a tall, thin, greying but energetic woman, the mother of the local priest. She explains how a Mr Poloratsky, the local landowner, built the church for Catherine the Great in 1790, anticipating her visit. Sadly, after receiving what she considered an unsatisfactory welcome en route, the empress returned to Saint Petersburg and never saw Krasnoye’s church. This incongruous structure survives today as a mere memory of the Russia of old; the wealthy class of feudal landlords whose estates covered the rolling farmland of European Russia. 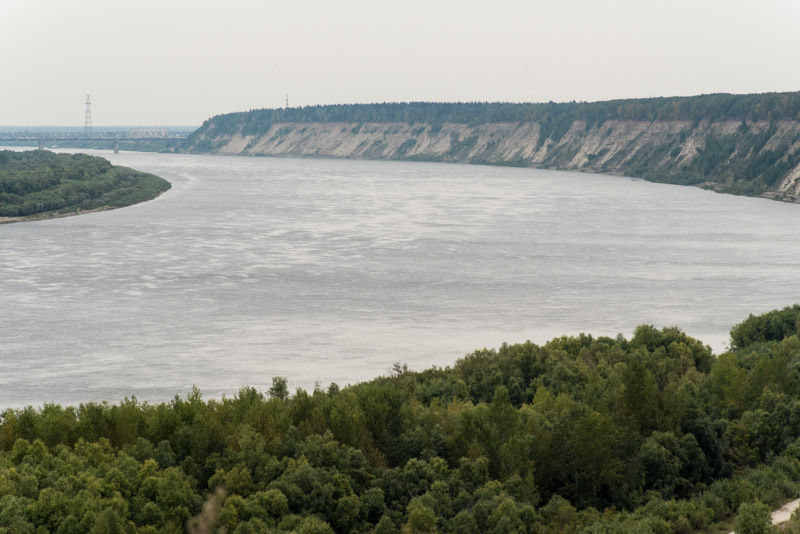 In nearby Rzhev, we cross the Volga once again, here already a sizeable river almost one hundred metres wide, then enter modern Russia in the form of the furious Moscow-bound traffic of the M9 Highway. As we approach the capital, this becomes a much-needed motorway, a rare improvement of inadequate Soviet infrastructure. We get caught in gridlock on the edge of Moscow, and it’s not until after dark that we reach Podolsk, where we are hosted by my friend Katerina in her parents’ comfortable self-built house. It’s nice to see Katerina again and tempting to stay for a day, but we must push on and so join the infamous MKAD, or Moscow ring road, where Saturday traffic is heavy but generally free-flowing. However, as we approach the M7 junction, roadworks cause traffic to snarl up and we barely move for an hour, reminding me of the hours I spent near here trying to leave Moscow on my first visit to Russia in 2007. Despite having driven several times in Tehran, Karachi and Istanbul, nothing in my experience compares to the gridlock of Moscow’s overwhelmed road system. Traffic remains heavy well out of the city and we soon see a four-car pile up happen right in front of us. After more than two hours the traffic starts to clear, but it is not until the afternoon that we feel to have escaped the grip of Russia’s unlovable capital. We continue east, driving into the night and stopping late to camp in a field. 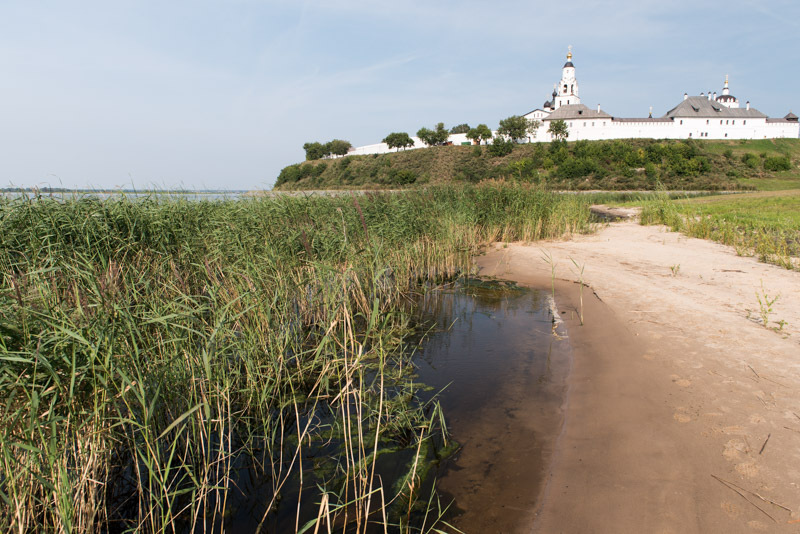 Waking up to a beautiful morning and the sight of low, rolling hills on the horizon, we make a short side-trip to the Volga and the fortress of Sviyazhsk, located on a hill now almost surrounded by the waters of the Kuybyshev Reservoir. It was from here that Ivan The Terrible launched his final siege against the Khanate of Kazan in 1552, a crucial step in the Russian subjugation of the Tatars, descendants of the hated Golden Horde. The fortress is teeming with Sunday tourists though this does little to detract from the dramatic setting overlooking the now very mighty Volga. We turn south, missing Kazan and leaving the M7, driving through the rolling fields of Tatarstan and notice a gentle cultural change with the appearance of mosques in the towns and villages, bilingual Russian and Tatar road signs and a more noticeable police presence. We end another long, hot day camping in a field having failed to find a suitable spot on the Volga. In the morning we pass through the northern edge of Ulyanovsk and cross the Volga on the new and very impressive President’s Bridge which runs for almost six kilometres over the vast river. This central Volga region of Russia, with prosperous industrial cities, friendly locals and beautiful rolling landscapes is perhaps my favourite part of European Russia and it’s tempting to continue downstream towards Tolyatti and Samara, but we turn northwards, doubling back into Tatarstan. We drive on a quiet country road through fields of dazzling sunflowers, freshly baled hay and neat Tatar villages, stopping in the town of Bolgar in the afternoon. Bolgar was the capital of Volga Bulgaria, a state formed by groups of descendants from Old Great Bulgaria (as were the Bulgars who moved west to become the ancestors of modern Bulgarians) which was destroyed by the Khazars in the seventh century. Sitting astride the Volga, then a trade route for the transport principally of furs from Europe to Asia, Volga Bulgaria flourished. Decline began with frequent raids by Russians of Novgorod and Vladimir-Suzdal early in the thirteenth century and soon after, in 1236, Volga Bulgaria was overrun by the Golden Horde. The Volga Bulgars, themselves of nomadic Turkic stock, integrated with the invading Mongols and Bolgar became a very wealthy city. When the Golden Horde split into Tatar Khanates around the turn of the fourteenth and fifteenth centuries, the Khanate of Kazan came to occupy an area similar to that of Volga Bulgaria, and whilst the capital was now in Kazan, Bolgar remained an important fortress city. 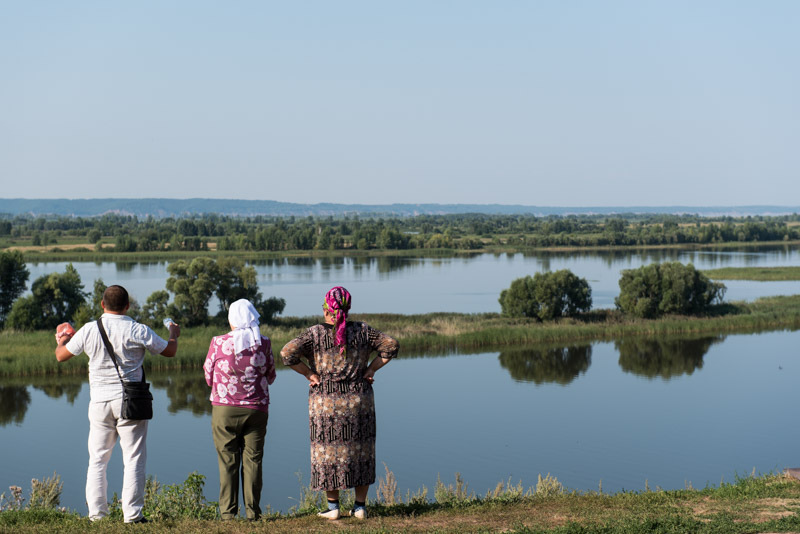 Bolgar is beautifully situated above the widest part of the Kuybyshev Reservoir, the largest in Europe, where the Volga resembles an inland sea. 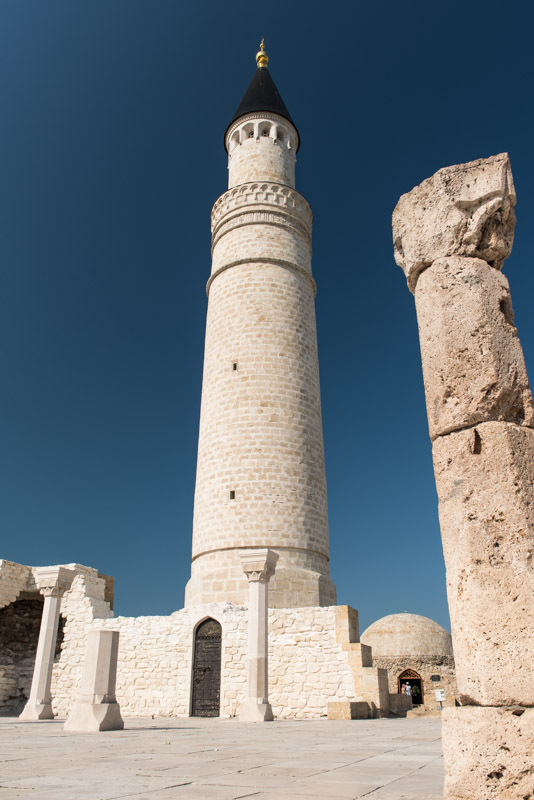 The museum complex consists of several mausoleums dating to the thirteenth or fourteenth centuries, the ruined walls of what is called a Cathedral Mosque, two reconstructed minarets and the very faint remains of the Khan’s Palace. Much of it is rather obviously restored and only the fourteenth century ‘Black Chamber’ retains much of its original form, with clear influences from Central Asian funerary architecture. The function of the building is unknown, but legend tells that the Khan’s family hid here from Tamerlane in 1396 who blackened the building by setting fires against it. The cultural significance of Bolgar is also interesting, as something of a cultural homeland for the Tatars, Russia’s largest non-Slavic and Muslim minority, whose culture is slowly re-emerging after decades of Soviet repression. Indeed, in Soviet times, Bolgar became a secretive place of hajj in place of Mecca. Compared to the legacy of the Ilkhans in Iran, the Golden Horde left very little physical evidence and so Bolgar is altogether quite fascinating, though any direct link between the Kazan Tatars and the earlier Volga Bulgars remains to be proven. From the beautiful summer landscapes of southern Tatarstan we head north the next morning towards the Kama River, the largest tributary of the Volga, passing through the noxious industrial city of Nizhnekamsk. The jaundiced light, fumes and broken roads of the petrochemical city are a far cry from the bucolic landscapes to the south, but it is heavy industry such as this which makes the republic one of the most economically developed regions of Russia. On the north bank of the Kama we stop in the pleasant town of Yelabuga where the sentinel ‘Devil’s Tower’ overlooks the broad river, remains of a supposedly tenth century Volga Bulgarian border fortress. From Yelabuga we leave the Volga region and head north into the outliers of the Urals, crossing into the Udmurtia Republic and making a brief stop in its capital, Izhevsk. Once Ivan The Terrible had defeated the Tatars, the Tsardom of Russia rapidly expanded eastwards into the Urals, an area long inhabited by various Finno-Ugric tribes such as the Udmurts. Initially a staging post in the conquest of Siberia, the Ural region was heavily settled from the eighteenth century onwards with the onset of large-scale extraction of the Urals’ mineral resources. 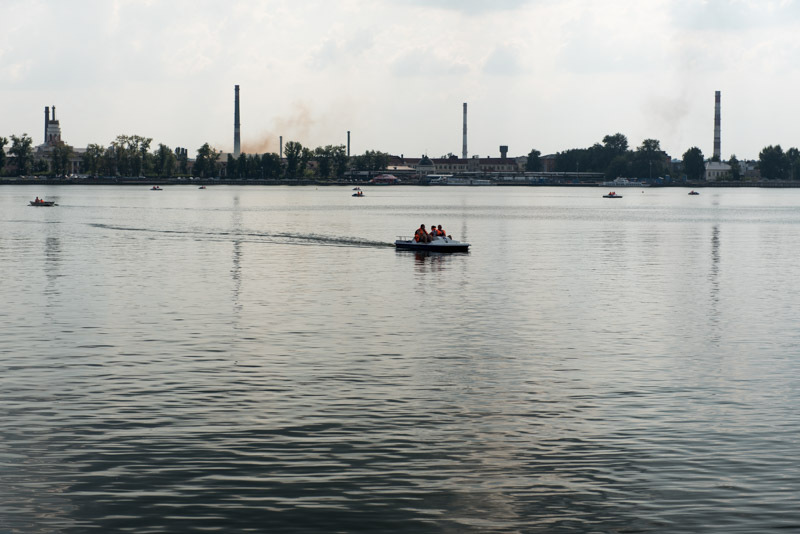 Izhevsk is exactly this; an industrial city which looks to have changed little since the Soviet period, dotted with smoking chimneys and a rather noxious looking city pond on which residents pedal pleasure boats on this sultry afternoon. Leaving Izhevsk, we pass through rural Udmurtia, noticing another subtle change in the landscape as stands of pine forest, the outliers of the great northern taiga appear, and villages become smaller, linear settlements of wooden houses with coloured window frames. We slowly climb over an undulating landscape, watching a hazy sunset over the unfolding ridges, arriving after dark in Perm. Like Izhevsk, the city of Perm was founded during the reign of Peter The Great as a factory city and would grow into a major industrial hub during Soviet times. Perm became a centre for weapons manufacture and would become a closed city during the Cold War, though today, with a population hovering around one million, it is a thriving Russian city. We are hosted by Vanya and Irina, a young local couple. Vanya drives us into town in the morning and we begin a lengthy walk around the city, whose centre is developed very much in the Soviet gigantic style. 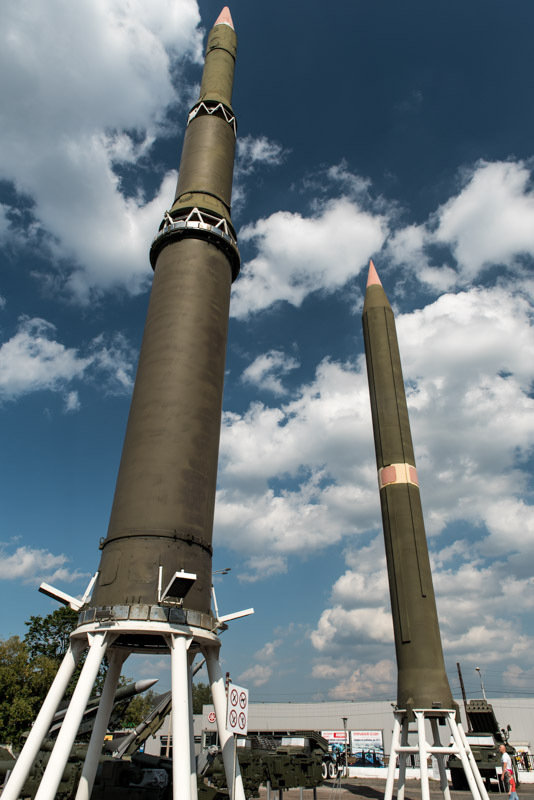 We meet with Vanya again for lunch and afterwards visit a small open air museum of the Motovilkha Arms Factory, where Cold War-era ICBMs and launchers are on display. Irina, Vanya’s elfin girlfriend works for Motovilkha designing components for aircraft engines, though she does not have clearance to know what these components are used to build. It’s perhaps not surprising that this arms city is busy and prosperous; throughout the turmoil of the Soviet collapse and recent crashes in commodity prices, the Russians Arms industry was one of the few parts of the country which was kept relatively healthy, vital for defence purposes as well as a source of foreign hard currency. In the evening we take a walk around the centre with Vanya and Irina. Vanya explains that whilst Perm was in the recent past a rather gritty place, today it is one of Russia’s more progressive cities, and we can see plenty of modern small businesses run by young entrepreneurs. We finish the evening in a smart restaurant serving dishes supposedly inspired by the cuisine of the indigenous Permyak people, stopping off at a craft beer shop on the way home for some excellent local IPA. East of Perm the Urals build into low, thickly forested ridges amidst which we stop to visit one of Russia’s most unusual museums. In the tiny village of Kuchino is a facility which was known simply as Perm-36 (a code name to keep its real location secret), which served as a prison camp from 1946 until 1987, well into the Gorbachev-era. Perm-36 began as a logging camp in Stalin’s brutal Gulag network which was conceived to provide slave labour for the rapid industrialisation of the Soviet Union and cow ‘free’ Soviet citizens into a state of terror. Perm-36 survived the dissolution of the Gulag network upon Stalin’s death in the 1950s, becoming a maximum security prison camp for the regime’s most difficult political prisoners, some of whom were locked in twenty-four hour isolation. 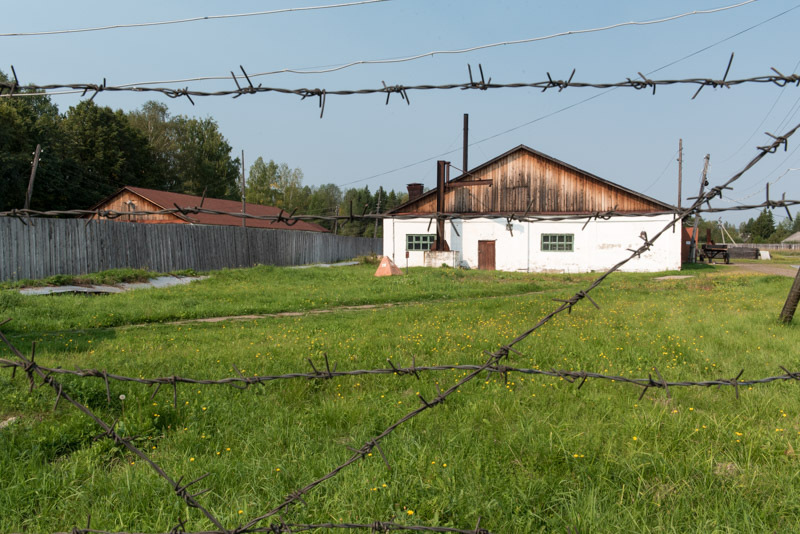 Perm-36 is the only such camp which has remained preserved as a museum, though rather disturbingly it has recently been subject to state harassment, with the authorities censoring some references to Stalin and Soviet leaders. We are given a short tour of the facility, which preserves the multiple barbed wire perimeter fences, a guard tower and most chillingly, the cold, concrete isolation cells where prisoners of conscience were held well into my lifetime. The Gulag represents one of the darkest sides of the twentieth century and I find it rather disturbing that resurgent, chest pounding Russian nationalism from government channels seeks to bury this history. In the nearby town of Chusovoy we turn north, driving through often rather grim industrial towns which are juxtaposed upon the beautiful wilderness of the North Urals. In the afternoon we stop in the salt mining town of Solikamsk which, beyond grim piles of salt tailings and rusting, derelict-looking infrastructure, reveals an ancient centre unexpectedly filled with seventeenth and eighteenth century churches. Solikamsk is one of the oldest towns in the region and was once the largest industrial city of Russia, with salt having been mined here since the fifteenth century, long pre-dating the industrialisation of cities such as Perm. The city is also important for having been the western end of the Babinov Route, the first practicable overland route across the Urals, which was established in 1597 and remained in use until the opening of the Siberian Route, much further to the south, in 1735. 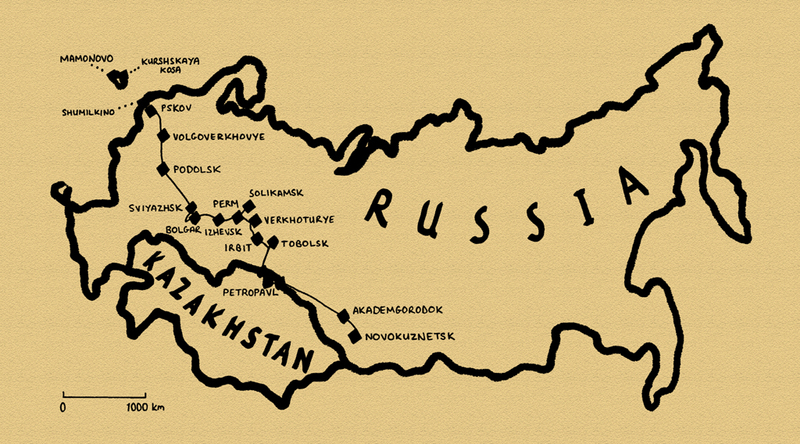 It was the Babinov Route that allowed Russia (using Cossack mercenaries and funding from the Stroganov Family) to rapidly expand into Siberia, thus becoming the enormous, resource-rich country that it is today. 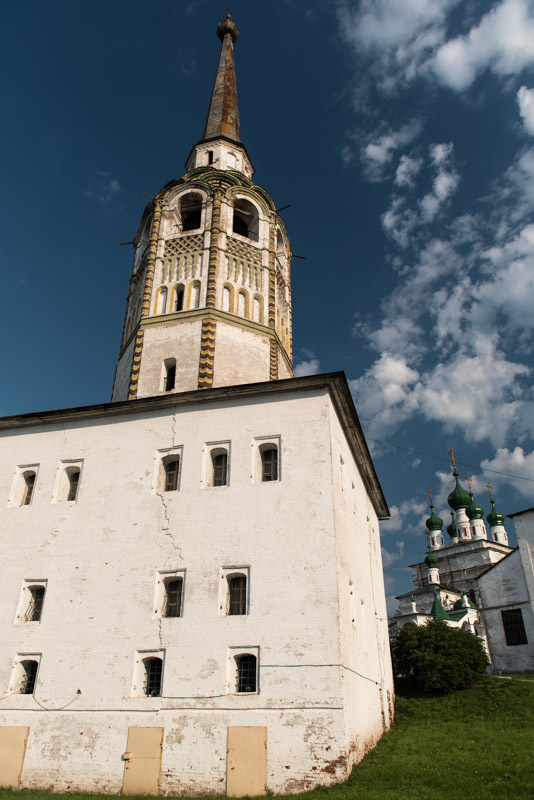 Sadly the Babinov Route has long since fallen out of repair and is impassable to vehicular traffic, so we must content ourselves with the view of Solikamsk’s 1713 Bell Tower, which once marked the route’s starting point. Solikamsk also seems to have fallen on hard times; whilst the town’s mines are working, the general atmosphere is rather less than friendly with hard-faced, thuggish looking men and women, drinking and arguing in the streets. We’re both pleased to leave what is perhaps my least favourite Russian city. After backtracking to Chusovoy we turn east onto a modern, paved road, the most northerly road across the Urals which is open to the public. On a gentle ridge just over 450 metres above sea level, we pass a whitewashed marker announcing that we have crossed from Europe to Asia; a singularly unremarkable transition which merely highlights the absurdity of this notional continental boundary. 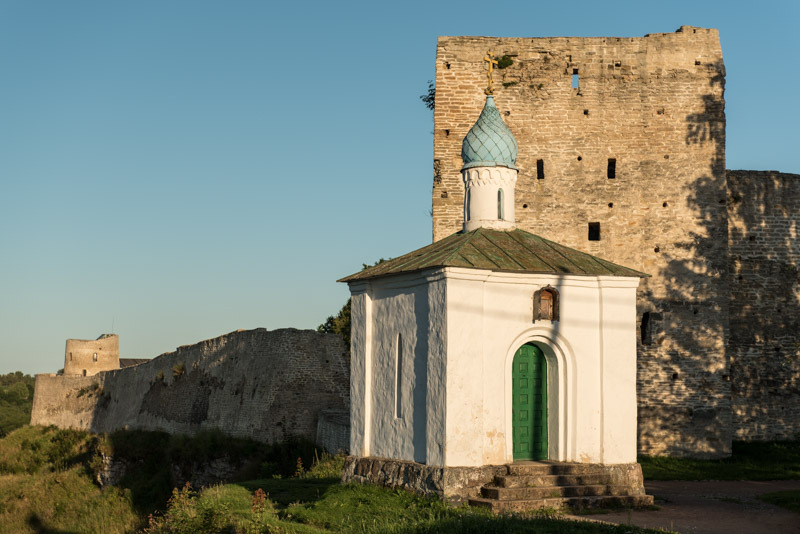 We make a detour to the north to visit the town Verkhoturye, which was established in 1598 as an ostrog (wooden fort) on the Tura River and marked the eastern end of the Babinov Route; the gateway to Siberia. 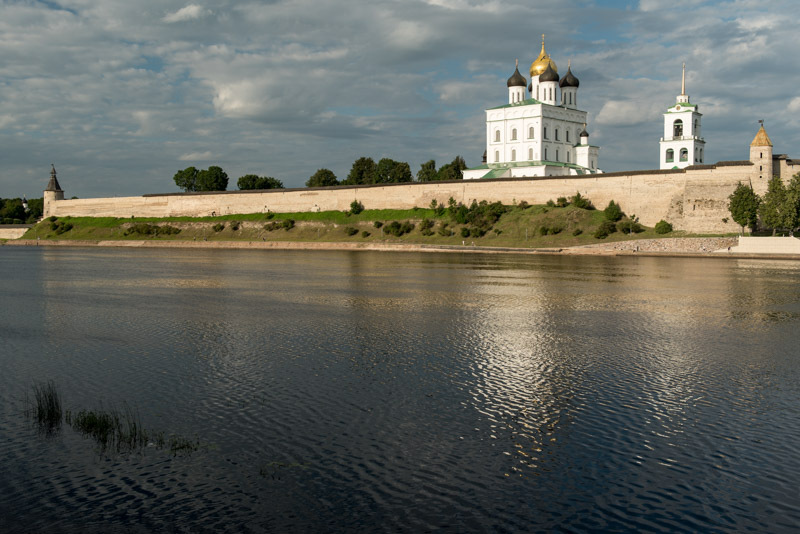 In stark contrast to Solikamsk, Verkhoturye is a truly beguiling place, feeling like a large village, centred on the slow Tura River, overlooked by a small whitewashed kremlin (fortress) and the soaring towers of the eighteenth century Trinity Cathedral. On this warm summer’s day, Verkhoturye presents a quite idyllic scene from bygone Russian, with children playing in the shallow Tura beneath a wooden footbridge which connects the town’s compact centre with the colourful wooden cottages on the south bank, with almost no Soviet concrete in sight. I leave Verkhoturye thinking I have found my favourite small town in Russia. We drive south towards Yekaterinburg then east, back onto small roads which take us out of the last ripples of the Urals. Here we enter the West Siberian Plain, the world’s largest lowland, and stop to camp for the night in a fallow field surrounded by stands of birch forest; a quintessentially West Siberian landscape. 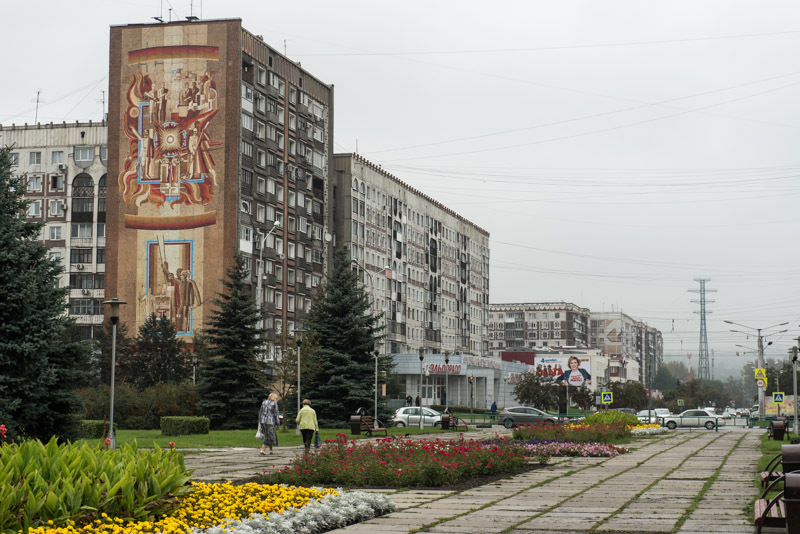 Our next stop, the following morning, is the rather run-down town of Irbit which, despite first appearances, was once perhaps Siberia’s greatest trade centre. Founded in 1631, Irbit soon came to be the location of an fair where the riches of Siberia could be traded. The eighteenth century saw both the signing of the Treaty of Kyakhta, which opened a border post with Manchu China, and the opening of the Siberian Route, a river route which would also become known as the Great Tea Route. Thus Irbit found itself at the centre of a huge annual trade in tea from China and furs from Siberia with manufactured goods from Europe. At the end of the nineteenth century the trade route shifted once more with the opening of the Trans-Siberian Railway far to the south. This, together with the upheavals of the Russian Revolution and Civil War put an end to Irbit’s fortunes; the last Fair was held in 1928, and the town has remained relatively obscure ever since. Although Irbit today is a scruffy place of damp, peeling nineteenth century buildings and streets with more than the occasional roaming drunk, there are still reminders of its past prosperity. The local museum has some old photos of the city and fair, and an exhibition on the Great Tea Route, but most interesting is the Passage building on the northern edge of the centre. Still a shopping centre today, the Passage was built in 1864 to serve as the fair’s store-front, with the opening of trade announced in the square out in front. Inside is a busy local market laid out on two open floors unlike any other I have seen in Russia, even with its own tea shop; a distant descendant of the old Tea Route. East of Irbit the land becomes wilder and the towns smaller and farther apart as we pass the southern edge of a huge marshland which stretches for hundreds of kilometres to the north. We cross into Tyumen Region, Russia’s richest, and immediately notice an improvement in the infrastructure as we bypass the capital Tyumen and join the heavy traffic of the main road leading north towards Surgut and the centre of Russia’s petroleum industry, via Tobolsk where we stop for the night. It was in this region in the late fifteenth century that another successor state of the Golden Horde emerged; the Khanate of Sibir, from which the name ‘Siberia’ may well derive. After conquering the Tatars of the Khanate of Kazan in 1552, Ivan The Terrible looked further east and through the Stroganov Family sent Cossacks across the Urals in 1580 to attack Sibir. Yermak Timofeyevich, the Cossack ataman (leader) took the Siberian capital Qashliq, in 1582, though he was killed two years later by a Tatar reprisal. However, his Cossacks went on to seed numerous Siberian cities, the second of these (the first was Tyumen) being Tobolsk, founded in 1587 at the confluence of the Tobol and Irtysh Rivers. We arrive in Tobolsk in the evening and are warmly received by our host Ilya with an excellent meal and home-made hazelnut vodka. Tobolsk is centred around a large and impressive eighteenth century kremlin which overlooks the rest of the city and reflects the fact that it was effectively the capital of Siberia until the late eighteenth century, and remained an important city until the end of the nineteenth when it was bypassed by the Trans Siberian Railway. Away from the kremlin however I am slightly disappointed with Tobolsk; what once must have been a beautiful Old City of traditional wooden houses has been largely displaced by ugly modern buildings or scruffy vacant lots waiting to be ‘developed’ (often after the old houses are burnt down) and the newer parts of town are bland and characterless. Only the mighty Irtysh stands aloof from this, silently slipping off northwards on its way across West Siberia, carving deep, gracious curves into its silty banks. Ilya drives us out of town briefly, slightly upstream on the Irtysh, to the edge of the village of Sibiryak where the ancient Tatar capital of Qashliq once stood. We meet a Kazakh working at a holiday camp who walks us to a viewpoint over the Irtysh and points across an overgrown and inaccessible ravine to a cliff where he tells us the capital once stood, though there is not a single visible trace of anything man made. I leave Maciej briefly in Tobolsk to make a trip down into Kazakhstan while he takes a bus to Omsk where we will meet tomorrow. 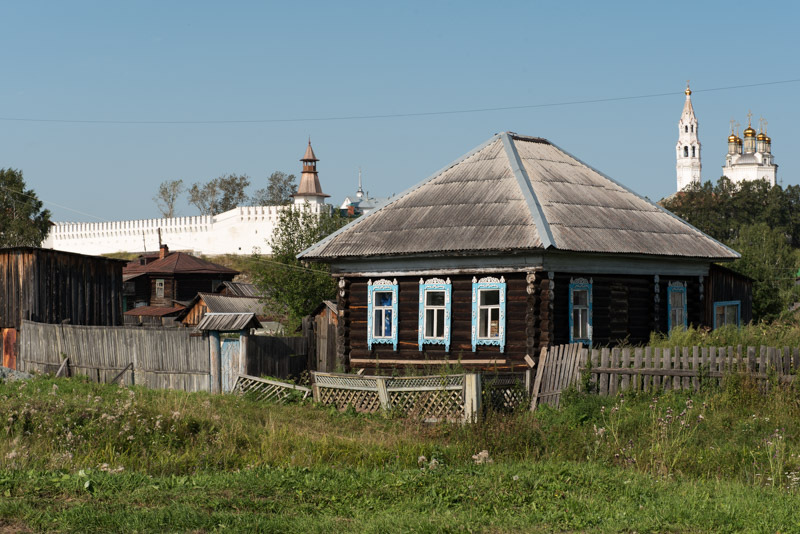 Crossing the Irtysh, I leave the main highway and head south on an excellent country road, passing through neat, lively Siberian Tatar villages dotted with pretty cottage-like mosques. The region’s hydrocarbon wealth seems to have trickled right down here and it’s very pleasing to see a part of Russia where rural society is in good health, though it makes me reflect wistfully on what Russia could be if it had a better managed economy. 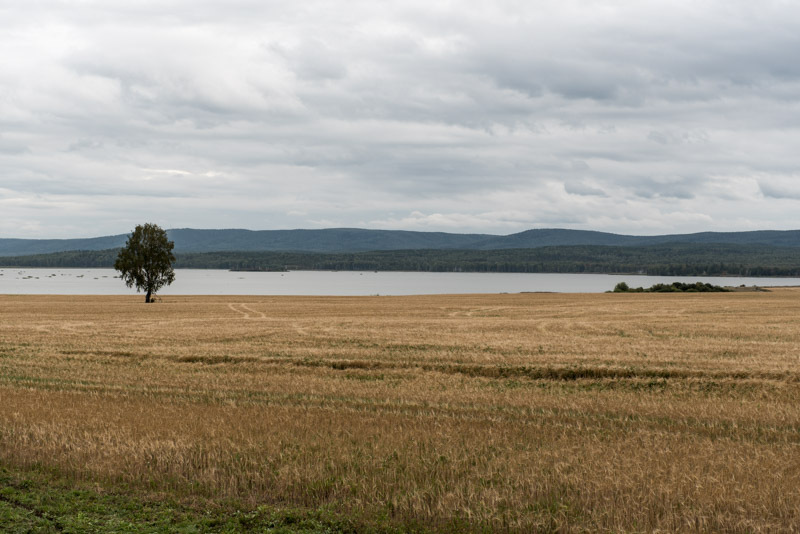 I drive straight across the Trans-Siberian Highway and Railway and enter a beautiful landscape of rich, prosperous farmland near Golyshmanovo, which is marked by its towering grain elevator above a busy bread factory. This is the cultivated swath of territory which marks the southern boundary of Siberia, beyond which the fertile forest-steppe gradually blends into dryer, true steppe, roughly demarcating the Kazakhstan border. 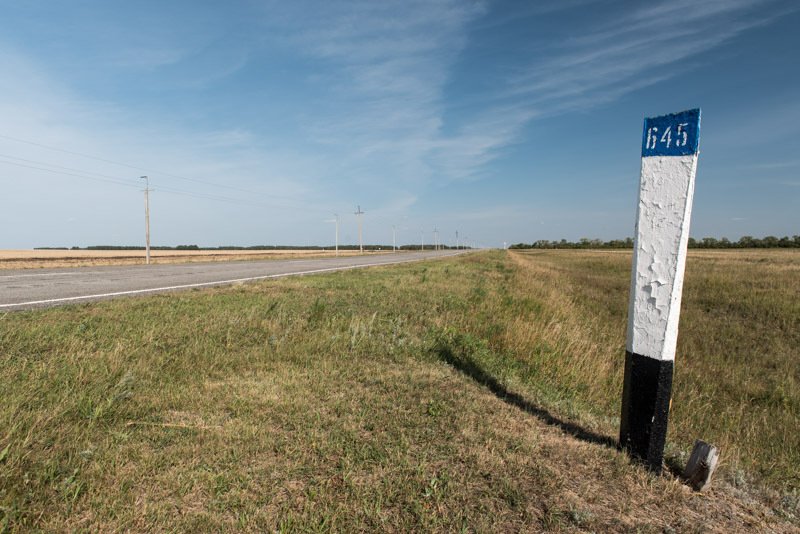 Joining the M51, the main Soviet-era Trans-Siberian Highway from Chelyabinsk to Novosibirsk, I head east and cross into Kazakhstan late in the afternoon, camping and driving into the regional capital Petropavl the following morning. After crossing the Urals, Russian Cossacks acting on behalf of the Tsar rapidly conquered the forests of Siberia using a network of vast river routes in the sixteenth century. Expanding southwards into the open Kazakh Steppe, populated by war-like tribes, was a more lengthy and hard-won process which began in the eighteenth century using a network of forts. These stretched along a line which became roughly the Russia – Kazakhstan border, and developed into a number of large cities such as Orenburg, Semipalatinsk (now Semey) and Petropavlovsk (Petropavl). Today there is no trace of Petropavlovsk Fort, but Petropavl is a pleasant, if rather dull city of modern Kazakhstan. My impressions are on the one hand of a city rather trapped in time, filled with Soviet touches such as a large, colourful wall-mosaic, or squads of ladies sweeping streets with brooms and whitewashing kerb-stones, but on the other hand of a city witnessing demographic change, as the Kazakh population slowly becomes a majority in a city which in Soviet times was largely Slavic. As I leave the city in the afternoon, I pass a turning to the south which leads to all the exotic yet familiar destinations of Central Asia and must fight a strong urge re-visit them, but I return to the old M51, re-entering Russia and meeting Maciej outside the station in the centre of Omsk in the evening. 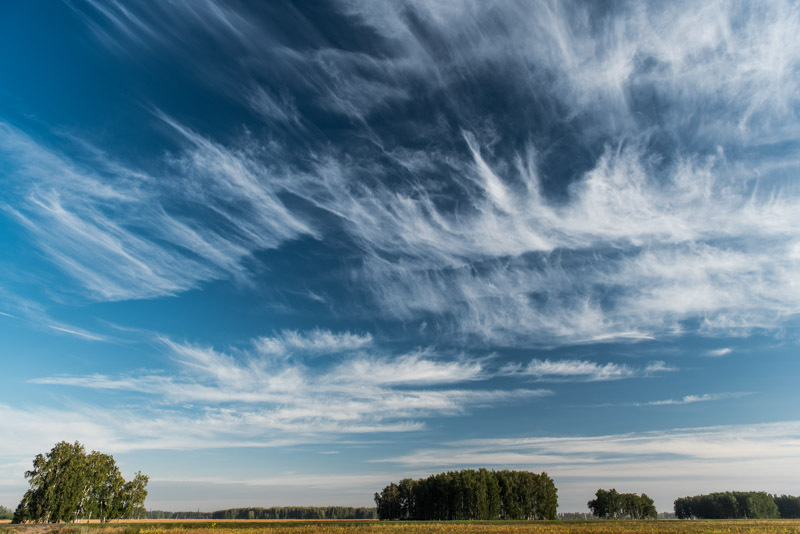 We wake up at our campsite behind a stand of birch trees to a magnificent morning; the deep crystal blue sky seems to glow with late-summer depth, painted with delicate wisps of cirrus hanging still above the quiescent landscape. We spend the entire day driving east on the Trans-Siberian Highway, driving without stopping through the seemingly endless landscape of the Baraba Steppe; fallow, cleared land, rarely farmed, with pockets of birch forest. After six hundred kilometres we reach the edge of Novosibirsk, Siberia’s largest city (and the third largest in Russia overall) crossing the Ob River on a dam, beyond which spreads the shimmering Ob Sea. We stop for the day in Akademgorodok, a detached city district built around Novosibirsk State University, where we are hosted by Ilyas, a Kazakh biologist with whom I stayed for a few days in winter 2010. Ilyas has recently married Nadya, the two having met through their shared love of tea. In the morning before we leave, Maciej and I are treated to a lengthy, almost meditative tea ceremony, based on the Japanese tea tradition, tasting delicately fragrant pu’er tea from one thousand year-old tea trees in Yunnan Province, China. Now east of the Ob River, as we leave Akademgorodok, we leave the West Siberian Plain and climb gently across the Salair Ridge, a low, outlying spur of the Altai Mountains. We descend again past Lake Tanayevo into the Kuznetsk Basin, famed for having some of the world’s most extensive coal deposits. Though settled by Russians since the early seventeenth century, it was only in the 1930s with Stalin’s rapid industrialisation of the USSR that these coal deposits were exploited on a large scale, used principally for the smelting of iron ore mined in the Urals. With this came a great demographic shift as huge numbers of settlers arrived in the region, and it remains the most densely populated region of Siberia. Reaching the rather grim and dirty mining town of Leninsk-Kuznetsky, we turn south onto a broad dual carriageway and by evening reach the region’s largest and oldest city, Novokuznetsk. Founded in 1618 as a fortress on the right bank of the Tom River, Kuznetsk was a bulwark against invading tribes, notably the Dzungars of north-western China, but was of little importance until the development of the region’s coal reserves. In 1931 Kuznetsk was merged with a left-bank settlement to form Stalinsk, which was renamed Novokuznetsk in 1961. Having suffered during the times of the Soviet collapse, domestic coal mining became profitable once more after the 1998 devaluation of the Rouble, meaning that Novokuznetsk today is a modestly prosperous place. 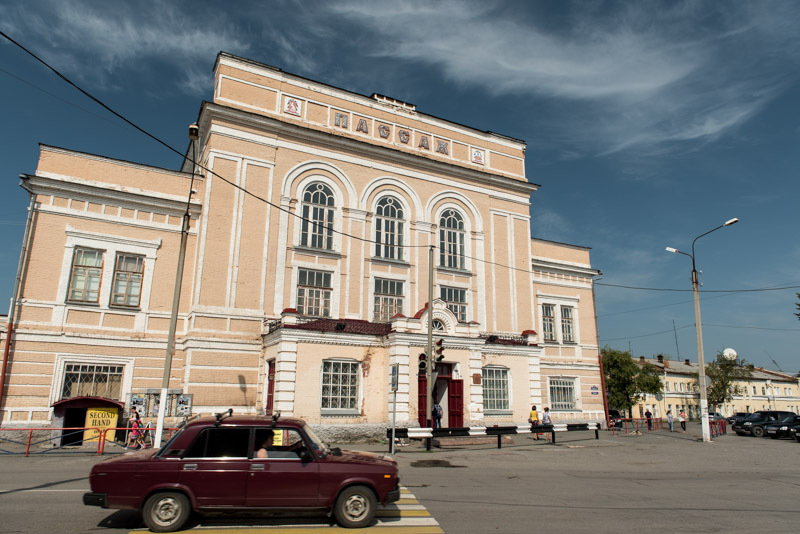 The city’s population remains lower now however than in Soviet times, and so there are few signs of modern development, leaving an urban landscape almost entirely built up during the heyday of the Soviet Union. 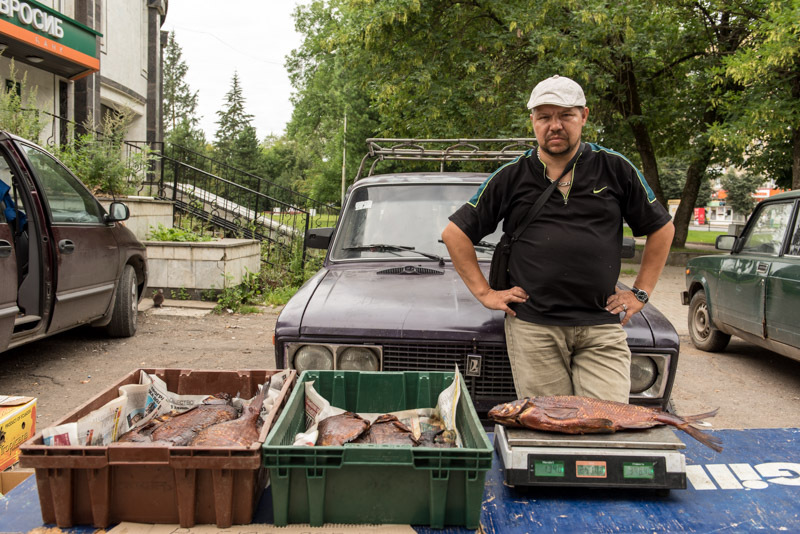 Maciej and I spend a day walking around Novokuznetsk, taking in its numerous Soviet touches; Stalinist architecture of Theatre and Mayakovsky Squares, statues of Lenin and Gorky standing side by side, and broad avenues lined with elegant rows of poplars whose yellowing leaves signal the onset of autumn. 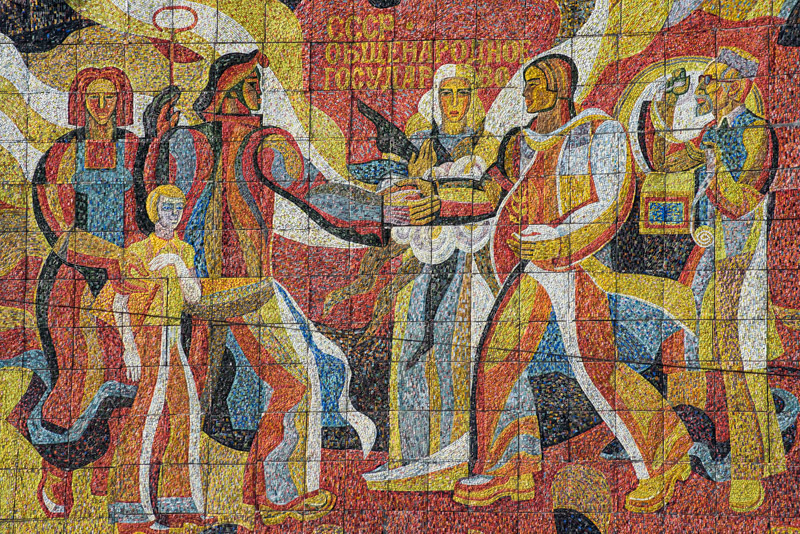 The city’s central square is an ocean of concrete; a large flower-like monument commemorating the fiftieth anniversary of the USSR, a monolithic city administration building and nine-storied prefabricated apartment buildings, one with a fine Soviet mural. Across the Tom River is the restored nineteenth century Kuznetsk Fortress, bracing for an invasion from the south which never came. Novokuznetsk makes a nice end point to our journey across European Russia and West Siberia. Ahead of us are the beautiful and fascinating republics along the Mongolian border, and the vast wilderness of Eastern Siberia and the Far East, as we continue our Trans-Eurasian journey to Magadan and the Pacific.